This delightful dessert, which combines the classic flavors of bananas, walnuts, and chocolate, couldn't be easier. They can be made by anyone with access to a microwave and are a perfect recipe for making with young children. In fact, you might wish you had an extra pair of hands during the dipping process, so plan to have an assistant available. Line a baking tray or cutting board with waxed paper. Secure the waxed paper with a piece of tape if necessary. Peel the bananas and slice them into 1/2-inch slices. Break the baking chocolate into pieces. In a microwave-safe bowl, add the coconut oil and microwave for 30 seconds. Stir and repeat at 15-second intervals until the chocolate is completely melted and smooth. Working quickly, place the bananas on the tines of a fork and lower it into the melted chocolate. Use a spoon to pour chocolate over the top until it is thoroughly coated. Scrape the bottom of the fork over the side of the bowl to remove excess chocolate and use another fork to slide the banana slice onto the prepared tray. Gently press a walnut half into the chocolate on top of the banana slice. If chocolate starts to become too thick, reheat it as needed. Chill the chocolate-covered bananas until the chocolate hardens, at least one hour. Serve chilled. Any chocolates that aren't enjoyed within 24 hours should be frozen for storage in an airtight container. Read the label carefully when shopping for chocolate. This recipe has been developed for semi-sweet baking chocolate. Although some brands of semisweet chocolate chips can be substituted (those without milk in the list of ingredients), other types of baking chocolate, such as bittersweet, cannot. Top some of the bananas with walnuts before dipping, to vary the appearance of the candies. 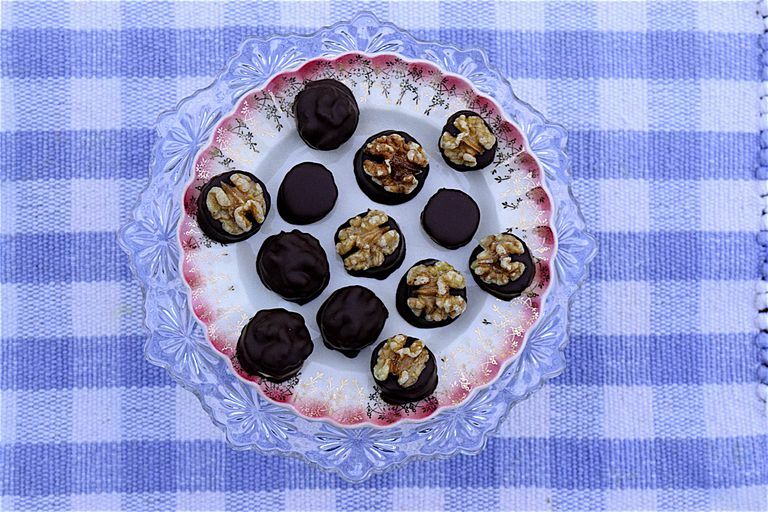 Pecan halves can be used in place of walnut halves. The same technique can be used for dipping a variety of other nuts or fruits; try dipping fresh strawberries, pineapple or peanuts. At first you may be able to submerge the bananas in the melted chocolate. But as the amount of available chocolate diminishes, you will have to tip the container and spoon up chocolate to pour over and coat the bites of banana. At this point, an extra pair of hands can be quite helpful.